Cameras, printers and displays are naturally flawed. Why? Because they are not capable of reproducing all of the colors the human eye sees, nor do images that are captured reproduce the actual colors seen in the object. For this reason, in 1976, a group of color experts teamed up to create a color calibration target that could mimic the color of natural objects, human skin and foliage and flowers, so that color could be replicated under various lighting conditions as well as when using different cameras. The X-Rite ColorChecker (formally known as the GretagMacbeth ColorChecker) utilized Munsell notations for each color on the 24 patch design. 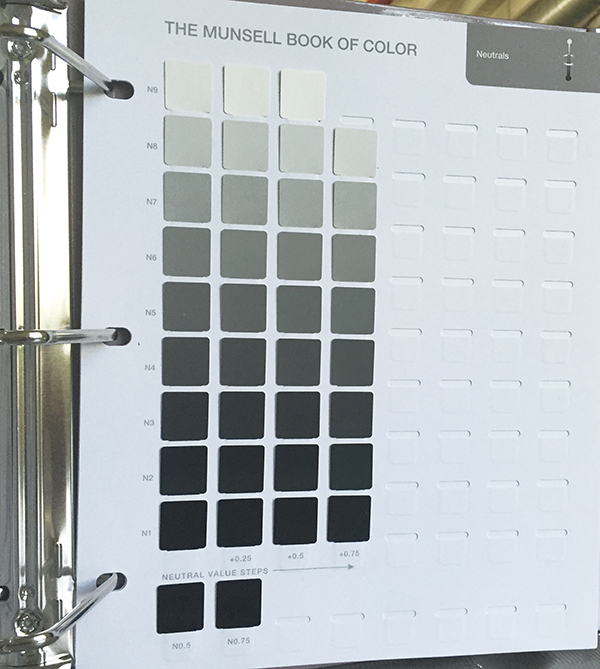 Since Munsell Color Lab would be producing the ColorChecker and it had become the federal color system adopted by the ANSI (American National Standards Institute), it made sense that Munsell notations would be used in the development of the charts. He was passionate about photography and helped produce the densitometers used in quality control for photographic prints and reproduction. The ColorCheckers could be used in conjunction with the densitometers for additional color control. Although the ColorChecker was originally developed for film cameras, because digital cameras have been designed to mimic what the human eye sees, these charts have become the standard for modern day color accuracy. Below is the original article that outlines how and why the ColorChecker was created. 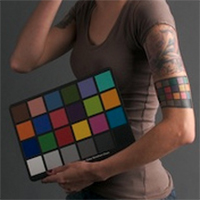 A color chart has been developed to facilitate quantitative or visual evalua­tions of color reproduction processes employed In photography, television, and printing. The 4 X 6 array of patches, each 50 mm (2 in.) 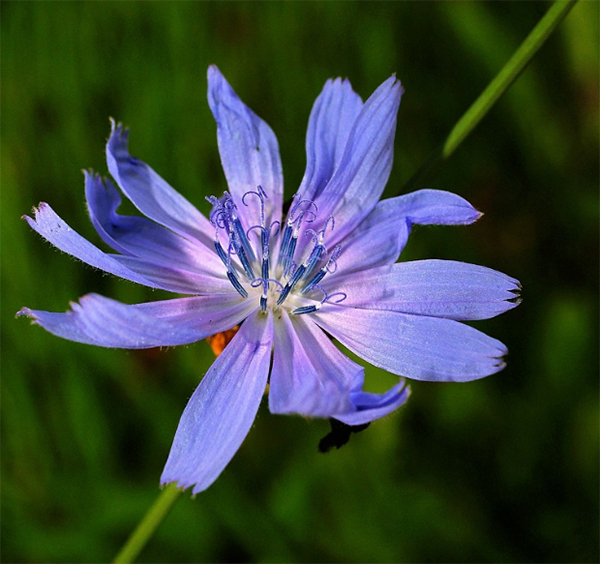 square, Includes spectral simulations of light and dark human skin, foliage, blue sky, and a blue flower (chicory). Additive and sub­tractive primaries and a six-step neutral scale are Included for analytical studies and other colors fill a wide gamut. 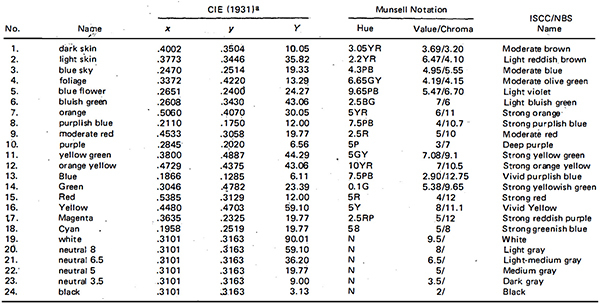 Each patch is characterized by spectral reflectance factor; as­signed name; CIE (1931) x, y, and Y; Munsell notation; and ISCC-NBS name. Photography, color printing, and television do not truly re­produce all colors. The nature of the rendition may be de­scribed in terms of the ways in which the colors in the image differ from those in the object. The image and object may be compared visually or by measurements. To facilitate com­parisons of this kind, we have developed and are making available a well-characterized color chart to be used as a standard test object. A color-rendition chart should include a well-spaced series of neutral patches ranging from white to black, a wide gamut of chromatic colors, additive and subtractive primaries, and patches having the same spectral nature as objects, the colors of which are likely to be critical or likely to present some problem.1 It is well known that the objects most likely to be considered critical in general-purpose imaging are human skin, blue sky, and foliage. In color photography, certain blue flowers have presented problems and some systems have in­adequately distinguished yellow and orange hues such as those; of oranges, grapefruits, and lemons. The size and shape of the chart- should facilitate production of images that can be measured. The patches should be well characterized as to color and spectral nature, and they should be durable enough to retain their useful properties for a reasonable time. These objectives have been met. The chart is a planar rectangular 4 by 6 array of patches, each about 50 mm (2 in.) square. The patches are made of a matte paint applied to smooth paper. The patches are glued to a rigid support and a thin black border surrounds each patch and the whole array. The assigned names of the colors, the colorimetric desig­nations in the CIE (1931) system and the Munsell system, and the ISCC-NBS names are given in Table I.2,3 The assigned names are simplified forms of the ISCC-NBS names, except for the first five, the primaries, and the neutral grays. The first five are not given typical color names, but are named for the objects they simulate with respect to color and with respect to spectral quality. The primaries are given the names that are customary in image technology: Blue, Green, Red, Yellow, Magenta, and Cyan and the names are capitalized because they are usually abbreviated B, G, R, Y, M, and C, respectively. The neutral grays are named the way the Munsell notations are usually spoken. The arrangement of the patches on the chart follows the table; numbers 1 to 6, in the top row from left to right, 7 to 12, in the next row, and so on, to the neutral scale from white to black in the bottom row. 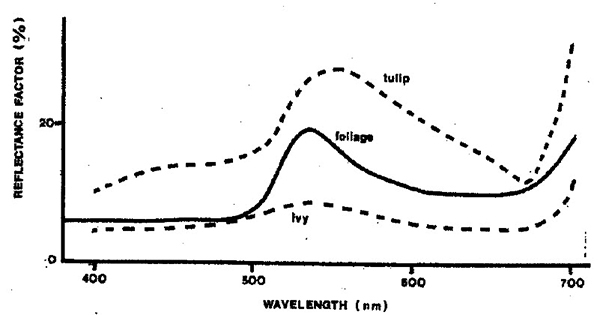 The spectral reflectance factors are given in graphical form by solid lines in Figs. 1-9. The broken lines in these figures represent the ideal distributions or ranges simulated. The paint formulations are not published because they are considered proprietary. The proportions of the chart are such that when it is photo­graphed on a full frame of 35mm film (known in photographic technology as a “double frame”) the images of patches are about 5 mm square, large enough to be measured with a den­sitometer. In attempting to duplicate the spectral reflectance of nat­ural objects or the spectral radiance of the sky by the use of paint pigments, we couldn’t expect exact matches. Given two or more possible choices of paint formulation, producing various spectral curves, we needed some way of choosing which was the best fit. Had we been dealing strictly with visually observed color, we could have minimized the color difference computed by one of the many color-difference formulas. That would probably have been quite adequate, regardless of which formula were used, because for close fits the difference would have tended to zero. It seemed more appropriate in our case, to evaluate closeness of fit in terms of the way a color film would respond rather than the way the visual system would respond. Therefore, we accepted as typical the red, green, and blue sensitivity functions for color films given in American National Standard PH2.28-1967 (Rl973).4 These were used as color mixture functions and were integrated with the paint reflectance factors and then with ideal reflectance factors, to obtain photographic tristimulus values X, Y, and Z for the paint, and Xi, Yi, and Zi for the ideal. We then considered the chromatic difference to be [(X – Xi)2 + (Y – Yi)2 + (Z – Zi)2]1/2 and formulated paint batches and corrected the batches to minimize this difference. Our paint laboratory was well equipped for spectrophotometry and the computations were done automatically by a digital computer. The values listed under Y are % luminous reflectance factors. The chromaticity coordinates are based on CIE Illuminant C.
The lightest human skin presented to the camera is practically white, talcum powder being commonly used. The darkest human skin is practically black. Neither of these ex­treme types modulate the radiant power distribution very much on reflection. The characteristic spectral distribution is more fully developed for skin somewhat darker than the lightest or lighter than the darkest.5 The characteristic spectrum results principally from absorption by melanin and hemoglobin, so the spectra for human skin of all kinds form a continuous homologous series. We chose to use a medium light and medium dark skin to test the ability of systems to reproduce the color associated with this typical spectrum, employing the higher exposure portion of the characteristic reproduction curve in one case, and the lower portion in the other. This test should help evaluate the significance of crossover of color balance from low to high exposure. Figure 1. 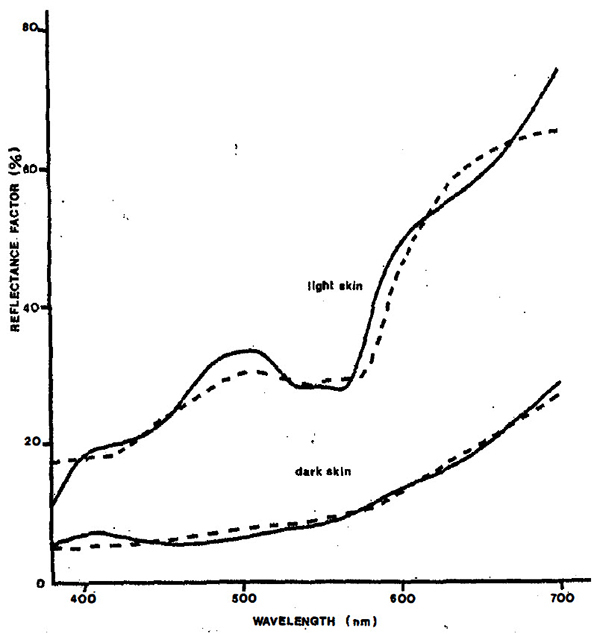 The spectral reflectance factors of the patches called “dark skin” and “light skin” are indicated by solid lines. The broken line for light skin represents the average value reported for light skin.5 The broken line for dark skin represents measurements made on a human arm. The spectral power distribution of radiant energy from the sky depends on the concentration and size-distribution of particles in the air and the geometric relationship of sun, sky, and observer. As a result, the sky has a broad range of spectral distributions and associated colors.6 The blue sky patch was designed to simulate the spectral reflectance factor of a the­oretical reflective “patch in the sky” which, when illuminated by Illuminant C, would have the relative spectral radiance of actual blue sky at a correlated color temperature of 30,000 K.
Figure 2. The spectral reflectance factor of the patch called “blue sky” is indicated by a soliday line. The broken line is the relative spectral radiance of actual blue sky at a correlated color temperature of 30,000 K, divided by the relative spectral power distribution of CIE Illuminant C.
Foliage varies widely in spectral reflectance factor and color, green foliage ranging from the deep green of the front of the English ivy leaf to the pale green of the back of the tulip leaf. The characteristic spectral curves of many species have been published by Nickerson, et al.8 We have measured many species, including common grasses. The foliage patch closely simulates the spectral reflectance factor and color of the front of a typical leaf of medium color. It should be a satisfactory object to test the ability of a system to reproduce the colors of foliage. Some blue flowers, most notably the morning glory of the variety “Heavenly Blue,” are prized for their blue color, but frustrate the attempts of photographers to depict them. These flowers reflect a great deal of radiant flux in the far red and near infrared part of the spectrum. This fact is not appreciated by the eye, so the observed color may be distinctly bluer than the clear blue sky. When a color photograph is made, the film may be sensitive to the excessive red light, rendering the blue flower as pink. We were not able to simulate this remarkable feature of the spectral reflectance factor of the morning glory, but we came quite close to that for blue chicory (Cichorium intybus), a roadside wildflower ranging over much of Europe and North America. This flower is particularly frustrating because there are both blue and pink varieties, sometimes seen together, and they tend to look alike on photographs. The photographic effect described is simulated well enough for test purposes. The primaries were selected on a somewhat arbitrary basis. We looked for pigments providing high chroma and spectral curves displaying no notable fine structure. In some instances, the formulations had been used previously to match specific photographic primaries. The neutral series is taken from stock colors used in the Munsell Book of Color. The series is equally spaced on the Munsell system. The percent luminous reflectance factors are: 90.0, 59.1, 36.2, 19.8, 9.0, and 3.1. The corresponding visual reflection densities are: 0.046, 0.228, 0.441, 0.703, 1.046, and 1.509, respectively. These values were obtained with a spec­trophotometer employing near normal incident flux and an integrating sphere to collect the reflected flux. The specularly reflected component was excluded from evaluation. This geometric arrangement adequately simulates the photometric conditions of diffuse daylight illumination or the type of illumination commonly used in studio color photography. Figure 3. The spectral reflectance factor of the patch called “foliage” is indicated by a solid line. The broken lines represent the spectral reflectances of the front surfaces of tulip leaves and English ivy leaves. These two species have the palest and deepest colors generally encountered in foliage. The remainder of the colors were arbitrarily selected to fill out the gamut of colors we considered of general interest and utility for test purposes. Figure 4. The spectral reflectance of the patch called “blue flower” is indicated by a solid line. 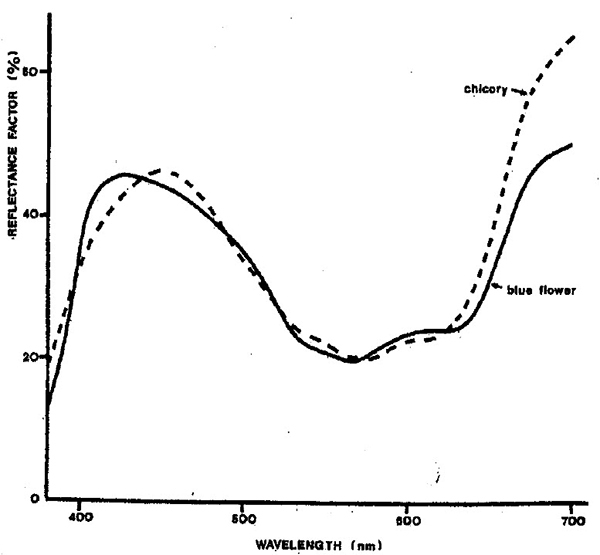 The broken line represents the spectral reflectance of a chicory flower. Figure 5. 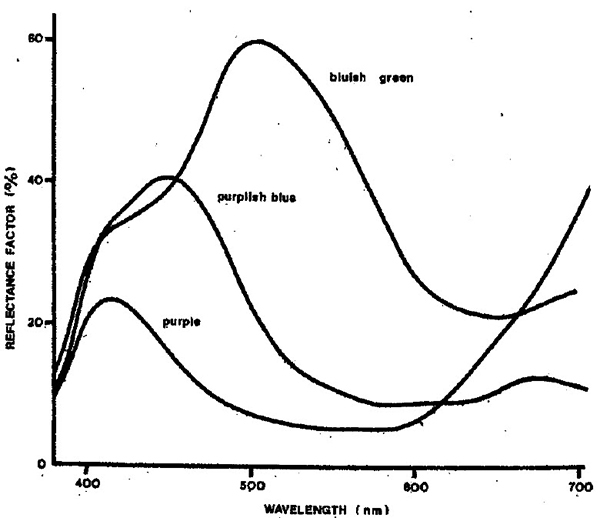 Spectral reflectance factors of bluish green, purplish blue, and purple. Figure 6. 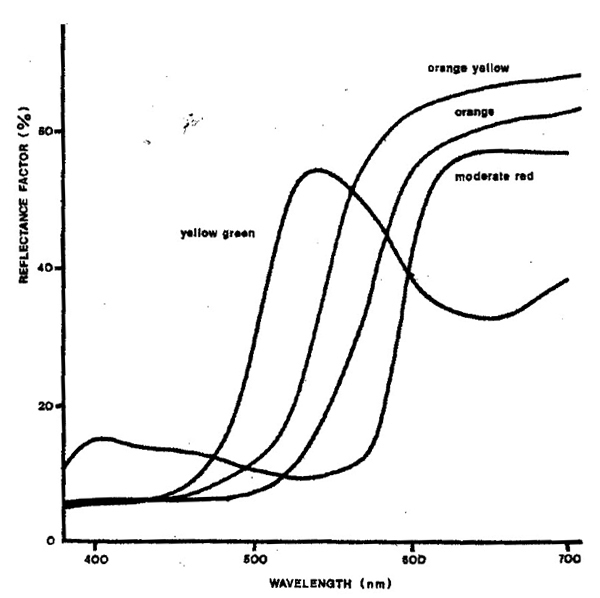 Spectral reflectance factors of orange, moderate red, yellow green, and orange yellow. The patches simulating skin, foliage, and blue flower were visually compared by experienced colorists to natural exam­ples illuminated by natural daylight at several times of the day in the summer, autumn, and winter, and also Macbeth Day­light with ultraviolet component included, CIE Illuminant A, and cool-white fluorescent lamps. The nonuniformity, which is characteristic of natural examples, ·made precise visual evaluations difficult, but the simulations matched the natural examples very closely. Experienced colorists found that the nature and degree of color difference was almost invariant as the spectral nature of the illuminant was changed. This ob­servation means that the degree of metamerism, that is, the degree of spectral mismatch, was very small for visual comparison by our observers. Figure 7. 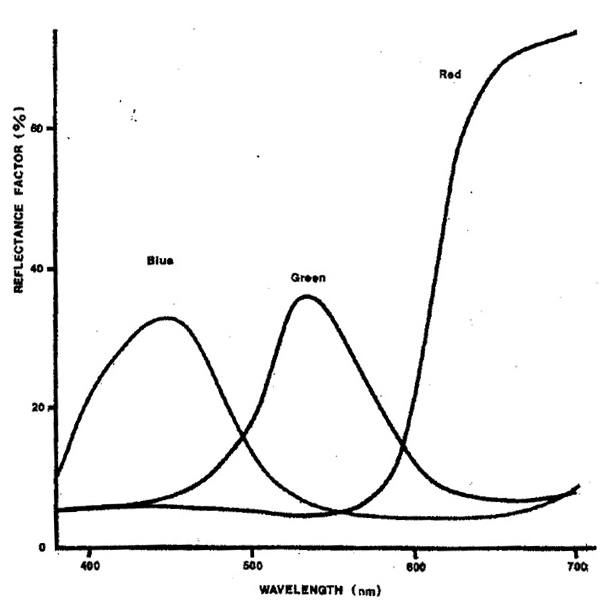 Spectral reflectance factors of Blue, Green, and Red. Figure 8. 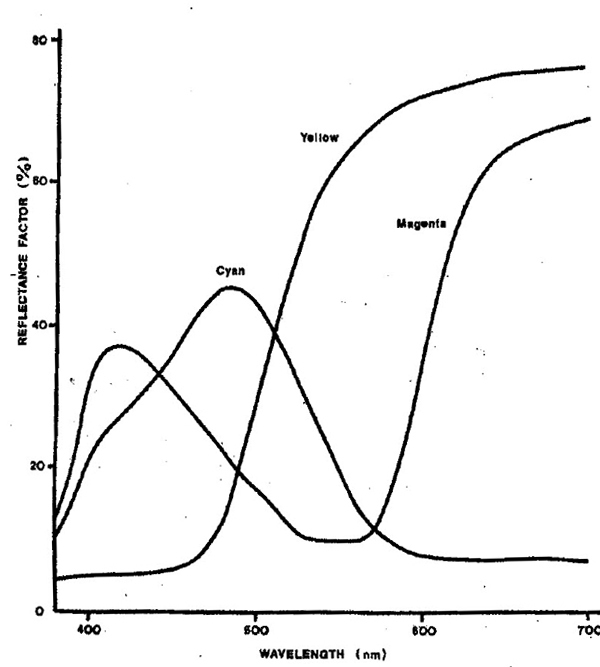 Spectral reflectance factors of Yellow, Magenta, and Cyan. To study the degree of photographic metamerism, the skin, foliage, and blue-flower patches were photographed with natural examples, using six widely-used color-transparency films manufactured by Agfa-Gevaert, Eastman Kodak, Fuji Photo Film, and GAF. The illuminants used were natural daylight, Macbeth Daylight with ultraviolet component in­cluded, CIE Illuminant A, and cool-white fluorescent lamps. Scene luminance was measured and camera settings were computed in accordance with the standard methods of the American National Standards Institute and several exposures were made using the computed aperture settings, one step smaller, and one step larger. Although there were marked differences among the renditions, the projected images of patches and natural examples on any one picture were very nearly the same color. We may conclude that the degree of photographic metamerism, with respect to most color slide films in common use today, was found by our observers to be very small. On photographs of real and simulated light skin illuminated by a cool-white fluorescent lamp, the real skin looked slightly greener than the simulation. The blue flower was the least accurate of the simulations. The reflection was not as strong as it should be at long wave­lengths; so the images of the simulation did not look as pink as the images of real flowers. Nonetheless, the patch should be useful in making many kinds of comparisons of processes. The color of the sky varies considerably from one part of the sky to another at any one time and varies even more from one time to another. We have made visual observations and color slides of a square patch of the simulated blue sky illuminated by natural daylight, lying on level ground beside a first-surface mirror reflecting a selected area of actual blue sky, which was an exact match when observed directly and when viewed on the slides. We have thus demonstrated that the patch ade­quately simulates one of the many phases of actual blue sky when it is illuminated by daylight. The orange and Yellow patches visually matched some samples of oranges and lemons, both freshly picked, not dyed. They matched when illuminated by Macbeth daylight with ultraviolet component, CIE Illuminant A, and a cool-white fluorescent lamp. The matches were surprisingly good con­sidering the fact that the fruit reflected somewhat more light of wavelengths above 600 nm than the corresponding patches. The texture and shape of the fruit probably affected visual comparison to some extent. On the basis of the experience we have had using the kinds of paints employed in making the patches, we expect the chart to be stable for several. years if it is only occasionally exposed to light. It could be used quite frequently without excessive exposure, but should not be left exposed to natural or artificial light when it is not in use. The chart may be used as the basis of a direct evaluation of a color-reproduction process by measuring the spectral or colorimetric properties of the image and comparing them to those of the chart. Perhaps the chart will more frequently be used as the basis of comparisons of films of various kinds, films of different age or subjected to different storage conditions, processing conditions, lenses, lighting conditions, the colors of studio walls, viewing conditions, slides of different age or object to different storage conditions, exposure, exposure time, or other aspects of the process that might affect color rendition. In any such studies, it is essential that all parame­ters be under control, that observations be based on proper statistical sampling, and that differences among observers be recognized. Reflection-type reproductions can be compared visually with each other or with the chart, under appropriate viewing conditions. They may also be compared by colorimetry or by measurement of red, green, and blue densities. The precise interpretation of density differences requires a knowledge of the spectral nature of the densitometer and the filters used in making the measurements. Transparencies may be compared with one another suc­cessively or simultaneously by projection in a darkened room or by viewing on a transparency illuminator under appropriate conditions. The viewing conditions for comparing transparencies with one another and transparencies with reflection materials have been standardized by the American National Standards In­stitute9 and the International Organization for Standardization.10 The standards were intended for use in the graphic ­arts where ink-on-paper prints are compared with reflection-type original art or with original transparencies, but there is no apparent reason that the same standards wouldn’t be appro­priate for comparing a transparency produced by some process with a reflective chart as the original. The standard illumi­nation for viewing reflection materials or transparencies has a correlated color temperature of 5000 K. When critical judgments are being made or it is important to be able to re­produce the viewing conditions in various places or at different times, the appropriate standards should be followed. Television displays and projected transparencies can be compared under appropriate viewing conditions. If these types of images are compared with the chart, it will be necessary to shield the source used to illuminate the chart so it does not illuminate and thereby degrade the video or projected image. It is erroneous to suppose that all objects the same color as a given patch on the chart will be rendered the same color by a three-r four-color process. Different materials having the same color often display differences in spectral reflectance factor. The spectral nature of the illuminant the spectral sensitivity of the sensors involved, and the spectral nature of the colorants used in the process may interact with various spectral reflectances to render different colors in the image, though the original materials matched visually. Figure 9. 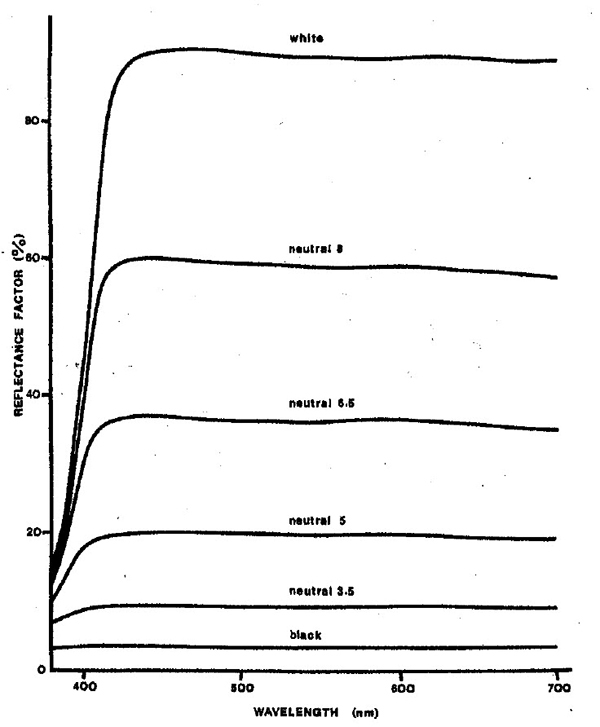 The spectral reflectance factors of the neutral series. Having developed a well-characterized test object, we feel obligated to point out that color-reproduction systems hardly ever reproduce all colors exactly. The practical limitations of such processes make perfect color reproduction virtually impossible. Compromises are necessary and the nature of the compromises essentially constitutes the art and science of color imaging. The end use must be carefully borne in mind and the evaluation made accordingly. Different people prefer different processes. Often one person may prefer different processes for different purposes. The chart is a useful ana­lytical tool, but final judgments should always be based on actual use of processes. After all, the ultimate objective is satisfactory results. This paper reports only our own experience with the chart. Much interest has been expressed by others and we hope we will learn of the experiences they have with the chart. We will consider making changes that such experience indicates are necessary or desirable. 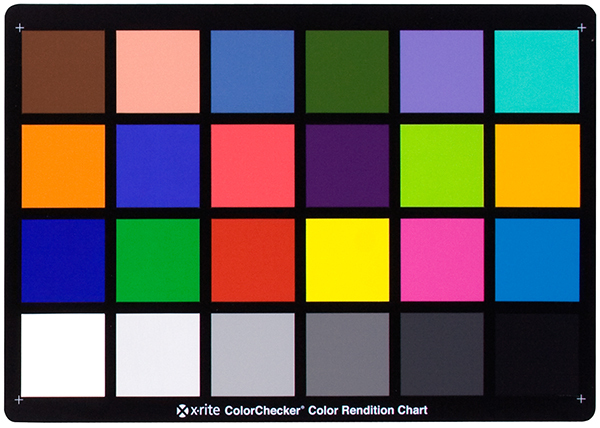 E. J. Breneman, “A color chart for use in evaluating quality of color reproduction,” Photogr. Sci. Eng., 1: 74-78 (1957). ”Colorimetry: Official Recommendations of the lntemational Commission on lllumi­nation,” Publication CIE No. 15 (E-1.3.1) 1971. Bureau Centraf de La CIE, 4 Av. Du Recteur Polncare, 75-Parls 16″, Franca, 1971. “The ISCC-NBS Method of Designating Colors and a Dictionary of Color Names,” U.S. Dept. of Commerce, National Bureau of Standards, Circular 553, 1955. 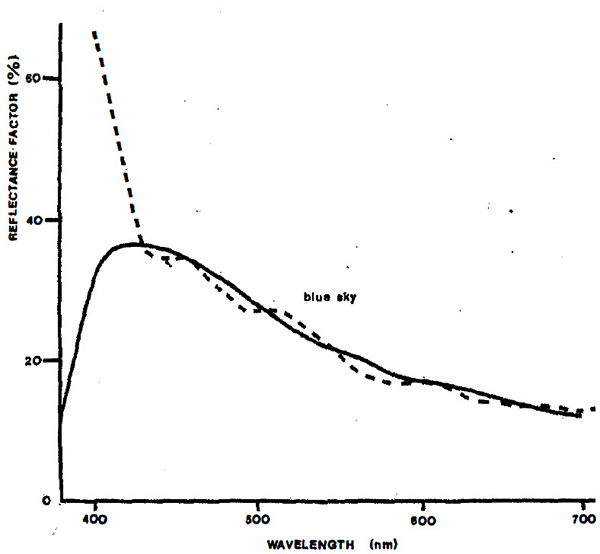 American National Standard Method for Evaluating Effective Spectral Energy Distribution of Blue Photoflash Lamps, PH2.28-1967 (R 1973), American National Standards Institute, 1430 Broadway, New York, NY 10018. G. 8. Buck II and H. C. Froelich, “Color characteristics of human complexions,” Ilium. Eng., 43: 27-49 ( 1948). D. B. Judd, D. L. MacAdam, and G. Wyszecld, “Spectral distribution of typical daylight as a function of correlated color temperature,” J. Opt. Soc. Am., 54: 1031-1040 ( 1964). C. S. McCamy, “A nomograph for selecting light balancing filters for camera exposure of color films,” Photogr. Sci. Eng. 3: 302-304 ( 1959). D. Nickerson, K. L. Kelley, and K. F. Stultz, “Color of Soils,” J. Opt. Soc. Am .. 35: 297- 300 (1945). American National Standard Viewing Conditions for the Appraisal of Color Quality and Color Uniformity In the Graphic Arts, PH2.32-1972. Part 1. The. authors are with Macbeth, Division of Kollmorgen Corporation, Drawer 950, Little Britain Road, Newburgh, NY 12550. Presented at the Annual SPSE Conference and Seminar on Color Reproduction, Barbizon Plaza Hotel, New York, N.Y., May 24-28, 1976. Original manuscript received February 12, 1976. Accepted for publication April 20, 1976. © 1976, Society of Photographic Scientists and Engineers. Today’s ColorChecker helps photographers and filmmakers speed up their workflow process and ensure color accuracy from capture to printing. They are an essential tool for every toolbox. Learn more about ColorCheckers. Thanks so much for this post. Learning the history of the chart is facisnating. Thank you for this post. Very instructive! The spectrophotometers are meant to remove the specular relfection part from the measurments by using adapted geometries. You said that this reflection component has been excluded from evaluation. But can you exclude it entirely? (if you assume that the specular reflection is actually interface reflection). You can find geometries that will limit the amount of surface reflection for matte surface but won’t there always be a bit left of it? That is actually desirable for printing and real world application but, and here the point, I’m working in the CG industry. In this field, we are refering more and more to the MacBeth colorChecker. But when authoring our materials, we are designing body reflectance and interface reflectance strictly independantly from each other. I came to think that we can not relate to the spectral reflectance measurments made so far for the MacBeth to setup our body reflection as there will always be a small amount of interface reflectance contributing to the spectrophotometer measurments, especially for matte object that tend to spacially redistribute evenly the specular reflectance. This seems especially true for the darkest patch of the macBeth, for witch interface reflectance contribution will be high relative to his body reflection. So is there still a bit of specular reflectance left in these measurments?